WE ARE BACK! After busy months of academics we start the year right as we visit the newest branch of KPub BBQ. The Trinoma branch is located in 3rd level, Garden Wing near Kimpura. The facade of the restaurant will surely get your attention with the colorful changing lights. As we entered KPUB, bright pink lights, tons of LED screens and a futuristic interior awed our eyes. KPub BBQ is not only known for its Korean futuristic design but also for it’s meat-all-you-can buffet so we decided to give it a try. After starving ourselves by not eating lunch before watching a movie we were really excited to eat to our stomach’s delight as we rushed to the 3rd floor of Trinoma. The very approachable waitress lead us to our seats and handed their simple menu. They have 3 choices of meat-all-you-can buffet which ranges from P499+ to P899+. The P499+ buffet or the beat the clock challenge was the most appealing to us since 7 signature meal dishes – namely – beef sukiyaki, pork belly, korean style bacon, marinated pork belly in sweet and spicy sauce, marinated pork chop, marinated chicken in sweet and spicy sauce, and marinated chicken in sweet soy sauce. It also comes with complementary steamed egg, kimchi-pajeon, choice of steamed rice or kimchi rice, soup, house salad and a Korean dessert. Other buffets like The Beat The Clock – Level Up or the P699+ challenge had 15 selections while the P899+ pesos challenge or the No Limits consisted of 17 meat selections! If you have a really big appetite, we suggest that you try the P899+ pesos. What’s nice about KPub is that all complementary dishes and all meat selections in your buffet package are UNLIMITED for an hour and the start time will only begin once the meat is served and already placed on the grill. The approachable attitude of the crew and the fast service of KPub Trinoma made our experience even better. After only 5 minutes, the crew already started serving the sauce that will be used for the different meats. The Ssamjang or the sweet and salty paste was my favorite while Tim preferred the Chojang which was sweet and spicy. The KPub signature sauce on the other hand was a vinegar based sauce with mustard and caramelized onions. The side dishes were served first and it came with the kimchi-pajeon or kimchi pancake which was paired with the steamed egg. 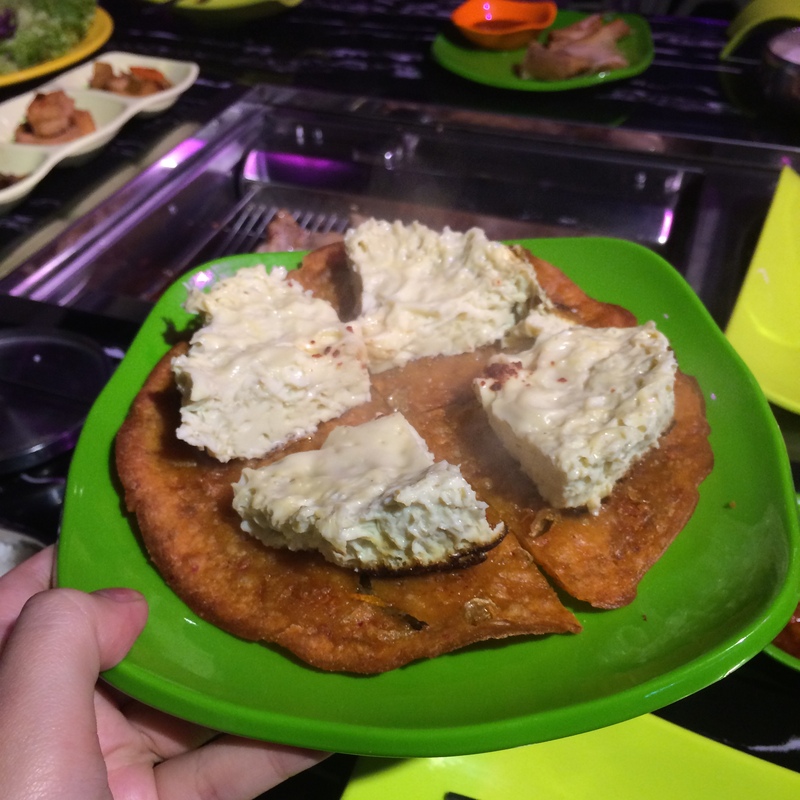 The kimchi pajeon tasted like the normal pancake but thinner and crispier. I actually didn’t expect it to pair well with the egg! The fried spring roll tasted like the familiar spring rolls and went well with the sweet and spicy sauce. We immediately started grilling once our orders arrived. Among the wide meat selection, we favored the korean style bacon, marinated chicken in sweet soy sauce, and beef sukiyaki. The korean style bacon was very thin and very easy to eat. Although it tasted bland like the other meats, it tasted well with the condiments provided. The marinated chicken was meaty and very flavorful. Even without the variety of dips/sauces, the chicken brought much delight. The beef sukiyaki, like the korean style bacon, was also quite bland but easy to munch! For dessert, we were served with sikyhe or the korean rice punch. We were informed that this sweet-tasting drink helps in digestion. We greatly recommend this restaurant not only for those people who enjoy Kpop but also for those who enjoy eating Korean food. We have tried other Korean barbeque places but KPub stands out because of their futuristic interior and meat-all-you-can promos. Thank you for starting your year with us and sharing the KPub experience. We hope to have you visit again either our Fort or Trinoma branches. Gansahamnida!